Contrary to the ‘classic’ 45.8% ABV, this special Talisker, bottled for the Friends of the Classic Malts, it bottled at 48%. It’s triple cask matured, meaning first in refill casks, then charred American Oak and finally refill European oak. I poured it at a tasting recently and it was an instant hit. The three typical Talisker traits (try saying that three times in a row!) are present on this fantastic nose: seaweeds, pepper and citrus. Blood oranges to be precise. Lots of sweet honey and dark fruit. Sweeter than you would expect from Talisker, but very harmonious. It is a bomb on the palate: dark fruit ready to burst, lots of salt & pepper, dark chocolate and cherries (Mon Chéri, anyone?). And wonderful trace of smoke that makes the mouth all warm. Do not be embarrassed to smile, you cannot help it. This Talisker will has that effect. The very long finish is stunning. Tobacco leaves, sweet malt and oranges precede liquorice and salt. And it just will not fade. Me? I’m on a cloud. Heavenly. And you can still get this for 80 to 100 EUR. What are you waiting for? Nose: very reserved, very sweet, a little peat. Mouth: strong, very peppery, sweet, some vanilla. Finish: you notice the oak, herb & mentholig, otherwise a subtle sweetness with a little spice & pepper back. This Talisker is OK, but does not knock me off the stool. very dry and woody with a nice smoke after cold ash. Tasting during XI. tasting BR and yesterday after a long time again. My overall score is the average of both tastings. Very good Talisker. Fresh in the glass blows a sweet fine smoke like from a campfire on the beach, on fruits I have fresh pears, mirabelle plums, a touch of vanilla and lots of nice cane sugar. With some time in the glass also darker berry fruits and a sourish fruitiness, in addition a strong greasy salt note. In the mouth, a peppery pungency that fills the mouth warming, then here, too, a clear smoke and a slightly unstructured fruit cocktail. Here I also have bitter oak and a nice tingling spicy with cinnamon and cloves. All this is not really strong, but works in spite of the strong for Talisker strong alcohol content of 48% strangely diluted and a little flat. As with most smoky whiskys, the finish is very long and dominated by the sweet smoke that sticks to the back of the mouth for a long time. A little light fruitiness joins in addition. Hey, what was that? 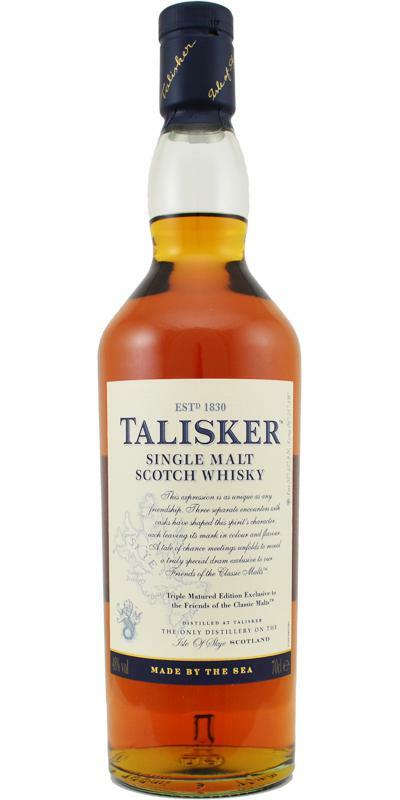 A long time ago I created the Talisker as a blindsample and totally different tasting notes. Today I had campfire romanticism and extreme chilli in the glass. A great Talisker, I increase my score by two to 89. A subtle seascape blows over the beach. Modriges, slightly burned wood mixed with fruity sweetness, dark berries play with subtle greasy smoke. A pinch of pepper develops a sharp note. Mineral hints and a hint of vanilla. The first sip of campfire romance is pure. Sharpness and fine smoke heat the palate, tart and smoky wood flavors end in chilli and pepper again. A walnut aroma makes its way through the intense wooden sharpness. Creeping embers and dark sweet fruits. Sharpness and burned wood dominate the beginning of the departure. It takes a long time for the sharpness to fade away. Bitter nut flavors and burned wood follow. A really unusual whisky! Spicy wood, this indefinable sour aroma and an unusual freshness in the taste make this interesting drop something special. A very tasty whisky and a new experience for me. Blind tasting: First, subtle but wooden sherry aroma flows out of the glass. The sherry aroma becomes more intense. Fruity orange flavors come through the wooden sherry. Overripe bananas join. The alcohol begins after a long smell to tickle in the nose. A subtle adhesive touch arises. First sweetness and fruit light up, then immediately creates a cool acidity. An indefinable and acidic aroma now dominates the taste before spicy wood exudes a slightly pungent aroma. Mint and an incredible freshness penetrate through the spicy wood. The fruit returns. Nut flavors alternate with the wood. Again, an acidic aroma comes to the fore. The finish starts peppery and spicy with a spicy woody aroma. Again this fresh and sour feeling. The finish is relatively short. After the spicy wood fades, light nut flavors come into their own.